I love this. Hospitality is not simply the practice of blessing others – by practicing hospitality, we become blessed ourselves. We are blessed by those whom we sought to bless, and this may mean that we are receiving the hospitality we wished to give. 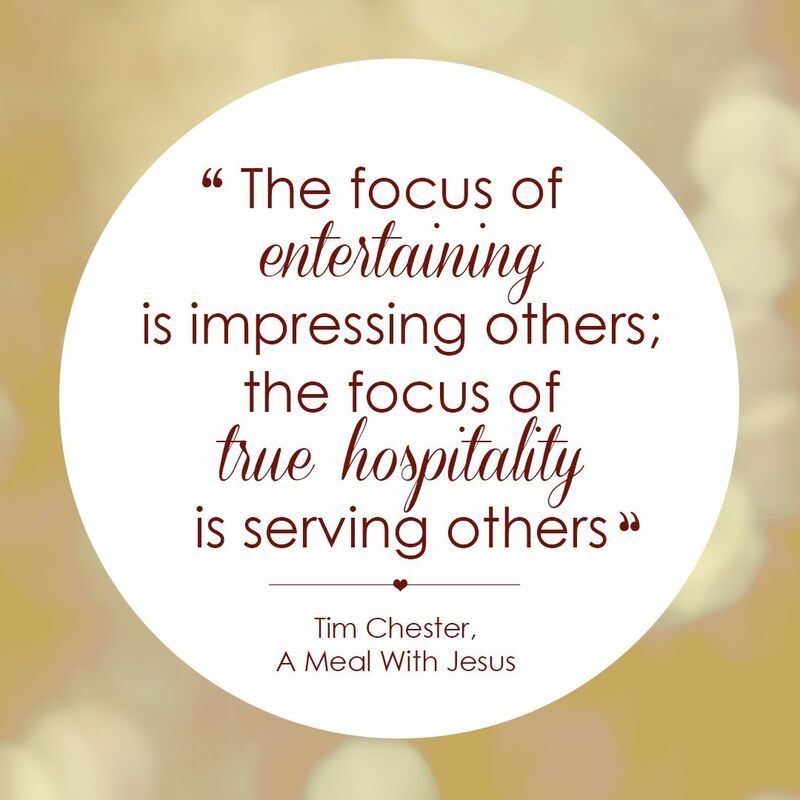 Developing the habit of hospitality will lead us to serve people like Jesus did. James Smith said we are liturgical beings, that is, “we are creatures defined by our loves, but those loves are shaped by formative practices.” Smith also said love is a habit, and that God gives us practices to “reorient our habits towards Him and His kingdom.” If we are defined by our loves, and love is a habit, then we are defined by our habits, and our habits need to be God-honoring if we want to be defined by God. The Greek word for hospitality is “philoxenia (φιλοξενία),” or a love of strangers. It is more than just inviting someone into your home – it is inviting those you don’t know, those who can’t repay you for what you’ve done. Hospitality looks like inviting others into your home, even when the toys are unorganized, the laundry needs to be folded, and dishes are still in the sink. Hospitality looks like inviting others into your messy life + sharing the vulnerable parts of your story. Hospitality looks like letting a friend borrow your car when their car has broken down. Hospitality looks like praying for one another, together. Hospitality looks like eating a home-cooked meal together around the table. Hospitality looks like taking communion together. Hospitality looks like serving others when they didn’t ask for your help. Hospitality looks like serving when no one will recognize what you did. Hospitality looks like sacrificing a few hours of sleep to listen and pray for a friend in need. Hospitality looks like offering a friend a place to stay when he or she fought with parents or a significant other and needs to get away for a few days. Hospitality looks like driving someone to the airport at 4am. Hospitality looks like paying for a friend’s gas when he or she can’t afford it. Hospitality is more than just having someone over for dinner – it exists both inside and outside the home. Let’s choose to move from simply being hospitable to making hospitality a way of life. Let it embody who we are, and become an unconscious action. Let it be ingrained in the fibers of our core. I have been blessed to receive hospitality from people all over the world, and it has taught me a lot about what true hospitality looks like. Below are a few examples of international hospitality. Israel is a very welcoming country, although the media does not often portray it as such. The Jews are quick to welcome strangers into their home, as it is a Biblical principle to invite nomads and travelers to stay for a meal and some rest. While in Israel, we stayed with a bedouin community, who were quick to offer us food, a tent to sleep inside, showers, and ride on their camels. We then met with one of the bedouins who explained the concept of bedouin hospitality to us. I was overwhelmed with the hospitality while on a trip to Italy with Fuller Seminary this summer. The shop owners of Orvieto placed a great deal of trust in complete strangers, allowing us to take our coffee and pastries outside, without paying, and then return to pay when we had finished. They trusted we would be honest and tell them what we ordered, not “conveniently” forgetting to pay for a pastry or two. The baristas sometimes came and sat with us at the table, striking up conversation about our day and sharing what they loved about their town. The entire town of Orvieto had the same sense of trust and invitation – I even received a bracelet from a shopkeeper as a thank you for helping her understand the English language. It was completely unexpected and filled with kindness. This is the epitome of hospitality. The people of Nicaragua have little that can be physically offered to strangers, as the entire country is living in poverty. Yet when we visited Nicaragua on a missions trip with Amigos for Christ (and to meet the Compassion children we sponsor as a church), the residents would invite us, complete strangers, into their homes for a meal. The Nicaraguan people would kill a fresh chicken and use it to make soup for our group – incredible! During the trip, I was seriously ill, and I received hospitality from Nicaraguan nurses (whom I had never met) who gave me an IV with fluids and checked on me throughout the week. I even received hospitality from fellow church friends who checked on me every hour of the night while I slept to make sure I was okay. The hospitality I experienced in Nicaragua was radical, and I left feeling that I had received more of the love I had expected to show the people of Nicaragua. Christian hospitality should be radical. So let’s let it embody who we are, leading us to be more like Christ in all that we do. *This blog was written for Fuller Theological Seminary’s Practices of Community class with Dr. Peter Lim.